A little bit of live and learn goes a long way, and Dave Gilbert is keen to make up for lost time after being one match away from quitting in 2011. 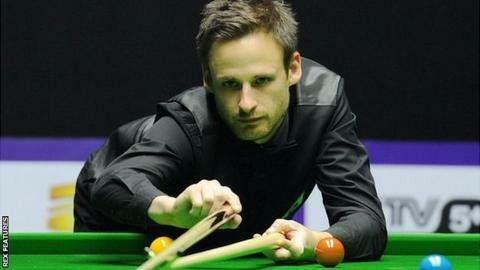 He is only 34, but in snooker terms, most of the best players have already made their mark by that age. The Tamworth professional reached his first ranking event final in China earlier this month, when he faced a resurgent John Higgins and lost 10-5. Gilbert jumped from 40 to 21st in the world after that run, but he is pretty sure he knows the main reason why he has under-achieved so far. "I'm a late grower-upper," he told BBC Sport. "I just got married and moved in to a new home and my missus Abi is keeping me in check a bit more. "I've not been the perfect professional in the past. I like a night out and I haven't been as dedicated as I should have been, but I am older and wiser." Gilbert is still enjoying the odd night out with his mates but has plenty more to occupy his time now - including a need to brush up on DIY skills. He explained: "I'm spending a fair bit of time stripping wallpaper and decorating at the minute." It's hardly wild living - but the change was needed and is certainly helping him on the snooker table. "I'm not saying I could have been five-time world champion, but I definitely feel like I have wasted many years," he added. "I am talented enough to have been competing at a higher level and have achieved more than I have." His next challenge is the UK Championship in York, where Gilbert faces Jason Weston in the first round on Thursday. And Gilbert, who was born in Derby but has lived in Staffordshire for more than 20 years, said: "I felt great in China. I felt relaxed and it seemed to click. My form is as good as it has ever been. I have never been so high up the rankings as I am now. "It was the best week of my career but I have already left that in the past. I am practising better than I ever have, and maybe now it's the right time in my life." "When things aren't going well my head has tended to go"
Being longer in the tooth is one thing. But there is also the question of mental approach, which he admits has been "questionable". "My mindset will probably never be perfect, but it's definitely improving," he said. "In the past I got the hump too easily. "My 'A game' is good enough, but in the past my 'B game' may as well have been a 'Z game'. "Players like Mark Selby and Neil Robertson find a way when things aren't going well but my head has tended to go." Gilbert dropped off the tour briefly after a disastrous 2010-11 season and, having lost in both of the finals of the first two qualifying school events, he had one more chance to win back his place. Gilbert, who first turned pro in 2002, explained: "I was talked in to Q School and when I lost in the final twice, I realised that the third final would probably be my last game of snooker if I lost." He conquered his nerves and beat Allan Taylor 4-1 and it had a galvanising effect, bringing an improvement in his approach, form and results. "Now I put the hours in," he said. "But the way tour has gone in the last few years has really helped too. "I was never totally committed but some of that was because it was difficult to see it as a career. "A few years ago there were five or six tournaments a year and it was a bleak for players from 30-50 in the world. "Now it is the best it has ever been. I wish I was 18 or 20. The younger players now can moan a bit but they don't get how lucky they are." It was when things were difficult that Gilbert got saddled with a "potato picker" tag, something that has stuck with him. "I wanted to work off season," he explained. "I have never expected to have things handed on a plate so I did various things. "I worked on a farm, drove a tractor, and I did a bit of potato picking, but it was hardly wandering around for weeks on end with a shovel and a bag. "But I suppose it sounds like a good story. I'm not bone idle, I would much rather be working and not be skint."